Tampa resident Ben Pakulski, left, is one of the subjects of the documentary "Generation Iron," which gives an inside look at the lives of bodybuilders. Currently shooting across the country, and most recently in downtown Tampa, filmmaker Vlad Yudin is doing something that hasn't been done before — rebooting a documentary. Inspired by 1977's iconic bodybuilding documentary, "Pumping Iron," Yudin is directing "Generation Iron," an update of the famed film that introduced many to Arnold Schwarzenegger and Lou Ferrigno. This time around, he's focusing on a new breed of muscle men, which includes Tampa resident Ben Pakulski. One of the top eight men the cameras are following, the Toronto transplant has been religiously lifting at the downtown Powerhouse Gym since arriving in Tampa. "The energy is amazing, the equipment is amazing and the owners are the best," says Pakulski, who goes by the nickname Pac-Man. "Everyone is so accommodating and understanding. They push me harder than anyone else." While the sport's fan base will surely check out the film, Yudin thinks seeing the sport's elite competitors' everyday lives, both in-and-out of the gym, will be the hook that ropes in both fans and outsiders. Matthew Midyett, co-owner of Powerhouse Gym where Yudin and his crew did much of their shooting last month, says there are differences between the two "Irons." "When they filmed 'Pumping Iron' back in the '70s, the bodies have changed," he says. "You could see how Arnold looked and he had that symmetry of that Atlantis looking Adonis. And now, they're bigger, freakier and more vascular, so the whole sport has really evolved. "This will be different from what ('Pumping Iron') used to be," adds Yudin. "It's more or less their stories. People say that bodybuilders are not interesting anymore; they think they're just boring meatheads. But it's way beyond that (stigma). They have a whole different level of thinking and psychology." The easygoing mass of muscle that is Pakulski, thinks Yudin's vision will help the sport and educate people not familiar with his chosen path. "I think it will be more interesting because fitness and health is so much more mainstream now. People will see that bodybuilders are real people," Pakulski said. "We're not just machines and animals; we actually have a lifestyle. We have family, a career, and we can have a conversation. 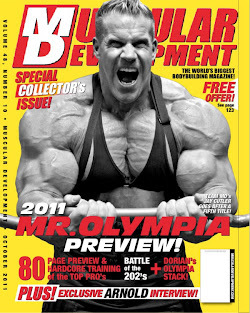 "(Bodybuilding) is just what we love to do, as opposed to who we are. I think it should take us to the mainstream and I think people will appreciate what we do. We're just people who love to push ourselves hard." Yudin, who bounces back and forth between documentaries and feature films, said it takes time and effort to get the bodybuilders to open up and talk. "They're not actors," he said. "Having a camera in their everyday life, it's overwhelming. 'Tell me what motivates you, what are your biggest fears?' It takes time to really get into their minds and then open up on camera." Although the filmmakers were unable to take advantage of Florida film tax incentives because the film is a documentary and only spent about seven to 10 days filming in the state — all in Tampa — they did hire a few local production assistants from the University of South Florida. Plus, Yudin and his producers wouldn't mind filming again in Florida. "If it was up to me, we would shoot here again very soon on our next feature," says co-producer Edwin Mejia. "Florida is a great state. … And I think there's a lot of improvement with soundstages and studios here along with the technology and personnel. The people (local film community) here really want to work."